I had started feeling a bit low after media told me that you have spoken against cow-protection. They said you “flayed vigilantism” in your speech and explained that meant that from now on any action that Gau Rakshaks take to protect the cow will be dealt with sternly. Now, I have been a part of the local Gau Raksha outfit for about 3 years now and had just been promoted from an intern to an actual functionary. So far, I used to assist senior members of the team in organising meetings, carrying out night vigils, raids and other action, if you know what I mean. Sometimes I would also help in procurement of equipment like loud-speakers, lathis, ropes and other mundane stuff. I was really looking forward to graduate to a senior level to be able to participate in some real action. Just when I reached within touching distance of my dream, media said you had essentially banned the things we were doing. However, my perspective changed entirely after directly listening to your entire speech on YouTube. I realised that these so-called highly educated media-persons failed to get the drift of what you meant. They only focused on your speech in parts and took home with them the words they really liked. There's no surprise that they are called presstitutes. Poor fellows didn't realise that only Gau Rakshaks can truly understand each other. I could have educated them had they asked for my interpretation of your speech, but you and I both know that they are full of themselves. Well, let them remain ignorant and carry on with their mis-reporting, but I must thank you for your words of encouragement. It was heartening for me to hear you compare acts committed in the name of Gau Raksha to the arson that people so routinely resort to across the country. When someone dies in a hospital and relatives of the victim thrash the staff and burn the hospital down, is that a communal act? Similarly, when a road accident happens and people kill the driver and torch the vehicle, is all that action directed towards a particular community? Of course no and that's how things are with the cow-protection movement. We take action against people irrespective of their religion and caste. In fact, their backgrounds just do not matter. What matters is that they have harmed our Gau Mata, which I am sure is a heinous crime under some section of the Indian Penal Code. And you are so right when you say that it is our Constitution that explains the greatness of the cow. I mean which part of Article 48 do they not understand? (A senior member of our team is an advocate during the day) Agriculture, animal husbandry, modern and scientific lines – it is all so clear. It is the Constitution that ordains us to stop slaughter of cows “and other milch and draught cattle”. The greatness of the cow is self-evident. And your “gaay ke aansoo” story! Oh, the story! Modiji, as people who live by the dharma, we have heard many stories all our lives, but I have never heard such an inspiring one! It went straight to the inner-most recesses of my heart and my eyes welled-up! Our gau-mata is so great! She is so loving, so caring and her soul is so pure that she will give up her life even if she accidentally harms another living being! Of course that doesn't mean that we must never harm any other being and I totally understand that. But this is not about me, its about our Gau Mata! How do people even have the heart to think about harming her, let alone the question of eating her. Modiji, your speech stirred up so many emotions in my heart that I have decided to work extra hours this week and carry out more raids than what I managed the whole of last month. At the end, Modiji, I would like to thank you for stressing that beef-eating is indeed a problem. Selling cows or giving them away is also a problem. Practicing a religion whose followers are popularly believed to be cow-eaters is the biggest problem. And thank you for asserting that! 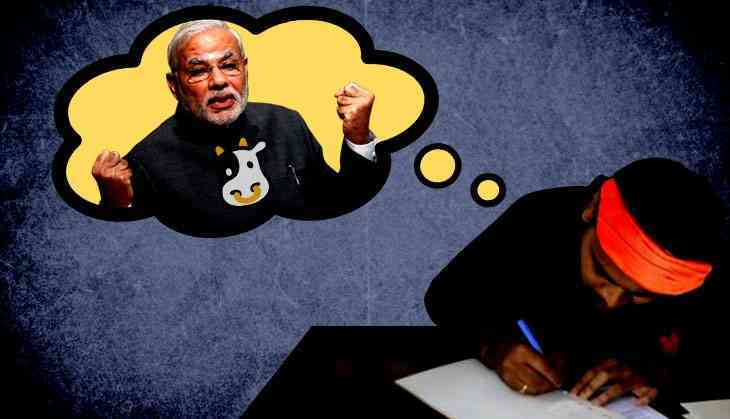 Dear Modiji, we Gau Rakshaks always believed in you as our guiding light and I am sorry that I doubted your intentions. I was misled by the presstitutes but have finally realised that you continue to be our patron. Thank you for reaffirming your faith in us and for your message to us that we should carry on the good work that we are doing, unceasingly.